Intense video captured several men in Lake Elsinore trying to battle a massive wildfire with a garden hose. LAKE ELSINORE, Calif. (WTVD) -- Wildfires have been blazing in California for weeks and some residents are proving that they refuse to sit by and let the fires burn on. That's right, the men were using the common hose to try and douse the flames outside of a home. As the men battle the blaze, police were seen rushing in. "Anybody else in the house?" police asked. "No, nobody is here ... we need the fire department (sic)," one man yelled back off-screen. There are more than 20 crew members from the North Carolina Forest Service aiding the efforts. 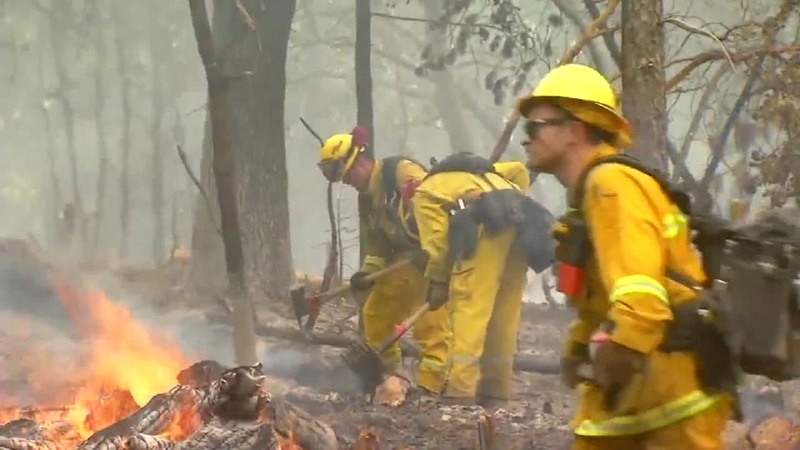 They are specifically helping with the Ferguson Fire, which has engulfed nearly 63,000 acres. The fire started on Monday but is only five percent contained. A State of Emergency was declared in California after the fire started to burn on more than 10,000 acres.